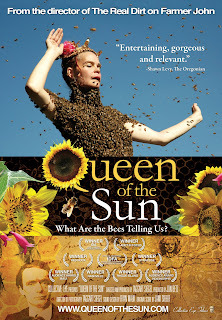 Review | "Queen of the Sun: What Are the Bees Telling Us?" Earth's honey bees are disappearing, and no one knows where they are going. Most plant life on Earth cannot survive without their pollination. It's a frightening doomsday scenario, a mounting crisis that can no longer be ignored. ries such as this. It is a film about a crisis, yes, but it's a film with a solution. Rather than wallow in fear-mongering, Queen of the Sun instead offers practical, real world solutions to a problem it still sees as reversible. This is an ultimately hopeful film, that takes an almost spiritual look into the often misunderstood world of bees. And most specifically, the phenomenon known as Colony Collapse Disorder, which has been responsible for the disappearance of countless beehives in the United States. It lays most of the blame at the feet of agricultural corporations, who have not only been genetically engineering their bees, but have also been disrupting the environment by planting such wide swaths of the same plant, effectively destroying the diversity of the bees' diet. As a result, bees must be shipped in from around the world to pollinate their crops in environments that cannot sustain their populations, not to mention introducing foreign diseases that American bees are not prepared to fight. Siegel isn't out to play the blame game, however. While the film spends a lot of time explaining why bees are so important to the environment and to human life in general, it doesn't do it just to set up the gravity of the crisis. It is genuinely reverent of the bees. 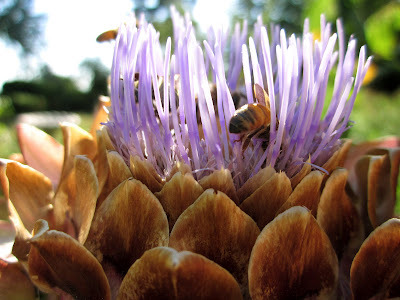 The film has an almost spiritual tone, interviewing beekeepers, scientists, and philosophers to create a well rounded appreciation of the honey bee. 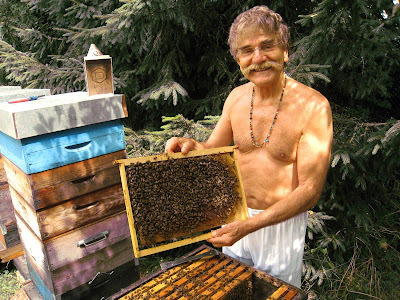 These people genuinely love bees, and their enthusiasm is undeniably infectious. On the other hand, while I applaud Siegel's refreshing avoidance of any kind of doom and gloom, I would have liked to have seen him explore the "canary in the coal mine" theory in greater depth. In his pursuit of a full portrait of the honey bee, the true gravity of the crisis seems to get lost. His subjects are so laid back and so gentle that the urgency of the situation is never really felt. It could have used just a bit more of that tension to give it a greater sense of gravity without falling into the trap of hyperbolic doomsday hysteria. The film's subtitle is "What Are the Bees Telling Us?" but that question is never really asked. Is their disappearance a warning? If so, for what? That's what I really wanted to hear, not necessarily a love story between man and bee. The final film feels more like an educational film on bees rather than the social advocacy documentary it is obviously trying to be. It's clear Siegel doesn't want to stir the pot, but you have to be a little bit forceful if you want to make any real change. I'm not advocating the in your face Michael Moore approach, but some tougher questions of the agricultural companies whose business practices are a major contribution to Colony Collapse Disorder would have been most welcome, since he lets them off pretty easy. That's really my biggest issue with the film - it's clearly a passionate film, and a beautiful one to boot, but it's also a strangely passive one. It offers some smart solutions to the questions it raises, but it almost seems timid when it comes to examining the root of this crisis. It's a disaster movie without a disaster, and while it's heart is in the right place, Queen of the Sun doesn't quite hit that perfect call to action bullseye. QUEEN OF THE SUN: WHAT ARE THE BEES TELLING US? | Directed by Taggart Siegel | Not rated | Opens Friday, 6/10, at the Cinema Village in NYC.